View as seen by the camera to be located at HUNAGI site, a planned new node of the Vv network. The network is capable to monitor clouds, lightings, storms, landscape and surface waters with a relative high temporal resolution. The panoramic data transmitted to the center are subject of further processing and database creation, establishing an infrastructure capable for advanced visualisation and multitemporal assessments. A new development enabling dynamic 3D cloud mapping is underway based on the use of the cloud image database provided by integration of the imageries transmitted by operators of webcams, the volunteer storm-hunters (Vv's) and the efforts of mathematicians and experts in informatics. A Call for join has been recently published by the időkép research and development team (www.idokep.hu). 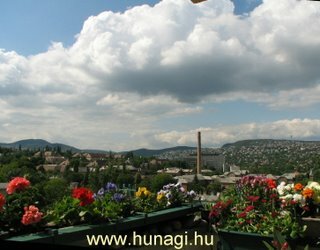 Please note, this website was many weeks long the No.1 website recommended by HUNAGI to be visited by the GI/GIS user community.